While wages have stagnated, income inequality has risen, and millions of Californians are struggling to make ends meet in low-wage jobs, industries from health care to manufacturing are still struggling to find skilled workers to fill open positions. The California Economic Summit’s 2016 Roadmap to Shared Prosperity outlines some policy ideas that can help close this looming “skills gap” by supporting the formation of regional civic organizations that can align the state’s expansive training and education programs with the needs of employers. A key component of that strategy is California’s Community College system, which Speaker Rendon believe can move faster in order to address the state’s critical workforce issue. 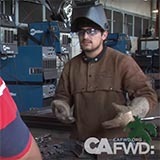 In the video above, California Forward asked about the state of California job training and efforts to close the skills gap.